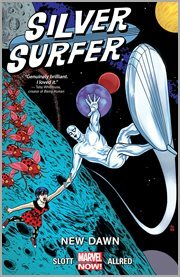 The item Silver Surfer, Volume 1, issue 1-5, New dawn, storytellers, Dan Slott & Michael Allred ; color artist, Laura Allred ; Letterer, VC's Clayton Cowles, (ebook) represents a specific, individual, material embodiment of a distinct intellectual or artistic creation found in Charlotte Mecklenburg Library. The Silver Surfer, sentinel of the cosmos, is often alone on his quest to defend space. All that changes when Surfer meets earthling Dawn Greenwood, a young woman determined to push the Surfer's boundaries. Plus, the introduction of the villain known as Never Queen! When Surfer tries to return Dawn home, he finds himself in his strangest battle yet with Shuma-Gorath!